In the late 1950s, when I was fifteen and seriously boy crazy I wrote six New Year’s Resolutions in my diary. Only back then I spelled them “reoloutions.” One: Take better care of myself. Jeez, I’ve been making and breaking that resolution for well over a half a century! Two: Get a boyfriend and show him off to the girls at school. Three: Make Dale sorry he went “which” Judy. “Which” was my dyslexia spelling for “with.” In my world any word that started with ‘w’ and ended with ‘h’ were used interchangeably for decades. (Dale, by the way, was the first boy who ever kissed me and fireworks literally went off overhead. How’s that for a memorable first kiss?) Four: Get thinner. That’s another resolution that’s been repeated more years than I’d care to admit. Five: Improve my personality. As an adult I can see the irony and humor in making that resolution on the heels of making one about getting revenge against poor Dale for throwing me over for Judy. Six: Do things to make me happier in 1958. That year, according to a list I found in the back of the diary, I kissed four boys and I also found a copy of a breakup letter I wrote to a guy so I was able to make one at least one of my resolutions come true. Side note: When Dale died several years ago, they had to cut him out of his house because of his morbid obesity. I was grateful it was Judy, and not me, who’d spent all those years cooking his meals. Fast forward to this century and the impulse to write resolutions is still part of my DNA but for New Year’s Resolutions 2017 I could be lazy and recycle four resolutions from my 1958 list: 1) Take better care of myself; 2) Get thinner, 3) Improve my personality and 4) Do things that make me happier. If I wanted to include the one about “getting a boyfriend” I’d start by switching my regular grocery shopping day to Tuesdays, just after lunch. That’s when the local veteran’s facility buses in a bunch of old men in wheelchairs who are being helped by equally old men helping them shop. I was in the checkout line behind one of the volunteers and his charges this week and I caught smitten-itis. He was my age to the month and day, had been a helicopter pilot with search and rescue in his career years. Totally wrong for me. If I was looking. For one thing, I don’t do spur of the moment and being in search and rescue is all about being ready for anything at any time. And two, my idea of keeping fit doesn’t involve a gym, rock climbing or repelling down ropes. That old guy is making the rest of us look bad! Back on topic: According to one statistic I found on the web, young people are more likely to make New Year’s Resolutions that older people and only 68% of Americans make them at all. But what I find more interesting is the fact that making resolutions is a world-wide tradition that dates back 4,000 years to the ancient Babylonians. Back then, according to the History Channel they started the new year after “the first new moon following the vernal equinox—the day in late March with an equal amount of sunlight and darkness.” They would celebrate the spring harvest coming in and the people had to reaffirm their loyalty to the king. Then in 46 BC that scandalous Julius Caesar introduced a new calendar, moving the beginning of the new year to where it’s still celebrated is today. Julius declared January first to be a day to honor its namesake, Janus, the god of beginnings. The Romans threw raucous parties that included offerings to Janus. When John Wesley (the founder of Methodism) came along he added his spin on New Year’s Eve in 1740 when he came up with an alternative to all the holiday partying---a church service where reflection on the past and renewal for the coming year were important. I was going to say that Julius had more influence over the way we celebrate New Year’s than pious John but then I googled church services on New Year’s Eve in my city and I found more services than I could count which just proves you’re never too old to learn something new about your fellow man. When I was looking for something to write about for this post-Christmas entry I bemoaned the fact that other than the family party and a last minute invitation for Christmas dinner with my brother and his lady friend, I haven’t been doing anything worthy of writing about except for knitting and who wants to hear about a gray-haired old woman spending her evenings knitting? At least I don’t sit in the stereotypical rocking chair, holding a cat while I work on my shawl, and did I mention I’m alternating that project with making hats on a loom? I had to make a hat because I broke the zipper in my winter coat forcing me to buy a new coat that none of my old scarves and hats matched. The only hat I could find in the store that went with the new burgundy coat was $18 and I wasn’t going to pay that much when I could buy a skein of yarn on sale for under three bucks. After that first hat was finished I made a child’s hat with the left over yarn and then I decided that I’ll get an early start on making a hat for everyone in my family for the 2017 party. Twenty-seven in all when I include the three new babies on the way. My mom used to make everyone hats for Christmas year-after-year and I’ll bet my showing up with a box of hats will bring back some good memories for more than just me. 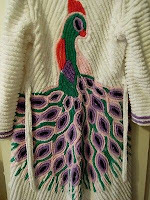 Stephanie Pearl-McPhee also wrote: “It is a peculiarity of knitters that they chronically underestimate the amount of time it takes to knit something. Birthday on Saturday? No problem. Socks are small. Never mind that the average sock knit out of sock-weight yarn contains about 17,000 stitches. Never mind that you need two of them. (That's 34,000 stitches, for anybody keeping track. )” I’ve never made socks, but if we get into a trade war with China, we could all be working a pair in a spare time. After reading the quote above, I did some math on the bias shawl I’m working on. When finished it will be a total of 663,000 stitches and that’s not counting all the times I’ve had to rip out a few rows and redo them because I forgot to do the increases or decreases that are supposed to happen every other row. Stephanie also says, “In the nineteenth century, knitting was prescribed to women as a cure for nervousness and hysteria. 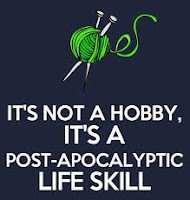 Many new knitters find this sort of hard to believe because, until you get good at it, knitting seems to cause those ailments.” She says a lot of things that ring true like: “...knitters just can't watch TV without doing something else. Knitters just can't wait in line, knitters just can't sit waiting at the doctor's office. Knitters need knitting to add a layer of interest in other, less constructive ways.” I agree with that second layer of interest. 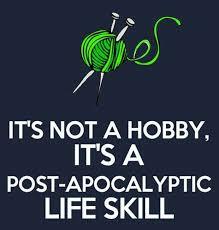 I can’t sit in a chair and just watch TV but I haven’t passed that threshold yet where I knit in public. Even though knitting has become cool again, I’m still hung up with a child’s embarrassment of having my mom knit in public. Christmas Ups, Downs and Oop, I'll Never do that Again! For the first time in fifteen years I didn’t write my annual Christmas letter. Since sending out that first one, I’ve tried to brand my letters as “self-deprecating humor” that summed up what I’d been doing over the year but this year I’m still in a state of mourning over the election and I couldn’t think of anything funny, cute or even old-woman-wise to write about. If I wrote a letter making light of our president-elect and how invested I got in the election, I know from reading Facebook postings that half my of husband’s family would turn against me upon discovering that I’m what they call a “libtard.” All liberals, in their minds, are not smart enough to come out of the rain or to get a job and we only voted for Hillary to get free stuff from the government. I dragged my feet about even sending out Christmas cards until this past weekend when I managed to send a scant handful. I’m sure there will be a few people on my holiday list who will assume I died. Before I actually do cross over, kick the bucket, eat dirt---whatever you want to call it---I don’t think anyone will be sending out Christmas cards or letters anymore. The stores don’t offer much of a selection like they did in “the good old days” and electronic cards are showing up in my inbox. Back when I first started sending out cards in the early ‘70s, my card list had almost 200 addresses. Last year my card list was 45 with just over half them getting the letter tucked inside. This year I managed to get out twenty cards with a scribbled sentence inside and I only did those because I was pretending Father Christmas was holding a gun to my head. Ohmygod! Maybe I am a foot soldier in the so-called war on Christmas! Aren't all liberals, she says sarcastically. Enough of the bah humbug, old lady having a hissy fit. I’m actually having a good week due mostly to having three very long phone calls spread out over four days. One was from a friend of almost 45 years (we always talk politics), one from a new friend from the senior hall (we talked about dieting and other stuff that had us laughing) and one call was from my youngest niece (we talked about life and death and the family). The weather report for our family Christmas Eve party looks good for me to make the hour trip to the boondocks and my oldest niece kindly offered to drive me home with her husband trailing behind us because she knows I don’t see well at night. It’s quite a bit out of their way but as long as none of us are endangering our lives driving in bad weather, I took take her up on the offer. It will give us a good opportunity to talk on the drive home and there isn’t anyone I enjoy talking with more than my two nieces. My oldest niece is more sentimental than my youngest niece but #2 surprises me from time to time. In our talk this week the subject of chenille bathrobes came up and I mentioned that I still have my mom’s 1940’s robe with a peacock on the back. I sent her a photo of it and she texted me back that it was gorgeous. “It’s yours if you want it,” I texted back. Oh, yes, she did want it adding, “I promise not to fry bacon in it!” In decent condition they sell online for $225 to $325, in fair condition they sell for less to up-cyclers who make vintage pillows out of them. I was going to put Mom's up for auction but I’d much rather give it to someone who loved my mother. It’s too fragile to wear but she likes the idea of hanging it decoratively. I gave her sister a couple of 1940s dresses a few summers ago and she has them hanging as part of her cottage décor. (The place could easily be featured in Country Living magazine.) Can you believe it, my husband and I found a funky store in the boondocks in the late 1990s that had brand new old stock clothing they found in their basement that they were selling for the original prices marked on the tags back in the ‘40s. I bought four dresses and the cutest, child sized English ride pants and sweater you’ve ever seen. We went back the next week intending to buy every dress they had to resell on eBay but someone beat us to the idea. I'm a day early with this blog but I'm posting it anyway so I can wish anyone who stops by a Merry Christmas and the happiest of happy holidays.